This ship is no longer operated by Tirrenia and is now with Trasmediterranea. The Dimonios has a capacity of 840 passengers and a load capacity of 350 vehicles. On board there is a selection or 120 cabins and facilities include a self service shop and children's play area. Please Note: Whilst we have taken great care in making our Dimonios guide as accurate as possible, onboard facilities, services and entertainment may vary depending on the date and time of year that you travel, facilities mentioned may change without notification and ferry companies reserve the right to operate vessels other than those mentioned at time of booking without prior notification. The boat was punctual and the staff helpful. "Excellent way to get from mainland to Sardinia"
We enjoyed our experience on the Dimonios, it got us comfortably from Naples to Cagliari on the overnight crossing. We paid extra for a cabin with a window, it had two beds and a little bathroom with a shower, toilet and sink- definitely worth the extra as we were much more comfortable (I usually suffer from sea sickness but with a pill and a lie down in the cabin I was absolutely fine!). We ate in the restaurant and thought the food was good quality and reasonably priced. All in all it was an excellent way to travel to Sardinia and we also saved on internal flights and one night's hotel accommodation, bonus! We took the ferry from Palermo to Cagliari in May. A smooth journey with a good, clean cabin for the overnight. It was on time and the org. on the ferry was fine. Was my first trip and was a really good experience. Nice cabine and helpful personnel. "Good and readable service "
It was a very long while since last time I travelled with a Ferrie and I was pleasantly surprised with the service and the quality of my journey. I would definitely do it again and I would recommend it to everyone. We had a great trip overnight from Naples to Cagliari on Direct Ferries. I think we were lucky with our timing as the boat wasn't very full and that made the journey very pleasant. I would suggest that people suss out the departure point for Tirrenia ferries as it is at the very end of the marina area and a good 20 minute walk from where the boats for Capri etc go. It is quite difficult to find as well so leave plenty of time. There is a left luggage place in the car park which was very useful. "Piurchased ticket and trip with Tirrenia"
Booking with Direct Ferries excellent, convinient price compared to the other travel agencies. Really rude dtaff, not professional. Cleaning just acceptable. Low hospitality. The arrival was 1 hour in advance. Unfortunately there are no other options to go from Palermo to Cagliari. I would have choose an other company otherwise. We travelled in 4-berth cabin from Napoli to Cagliari, the 2nd and the 15th of July. Comfortable trip, really clean cabin, restaurant was a bit expensive but good. The only annoying thing was on the return, our neighbors were Tirrenia staff and they were really noisy. I recommend the company. "very pleasant trip at night"
Lovely experience by boat from Sardinia to Sicily. Everyone recommended to do this at night, very efficient. Only problem is that you are in southern Europe where no one speaks or understands English. If that's all... Boarding went well, for both cars and foot passengers. On board, however, little amusement and entertainment, as opposed to our boat trip from the mainland to Sardinia. If this is not an issue for you then no problem. Food is only from a buffet table and we found this a bit of a problem. The cabin was really well prepared and spacious. For families consisting of two adults and two children, there's more than enough space. The beds were long and wide enough, and so was the bathroom. All in all a very successful trip with excellent facilities. Language, buffet and fun onboard should be improved. "Ferry between Palermo and Cagliari"
Choose a first class cabin! "Beautiful ship on a non daily connection "
Modern very good and clean ship. The only thing was that on departure we were given an inside room where we booked a room with an outside view. Luckily not all rooms were given away when we reclamed at reception. Clean ship and air conditione too high. 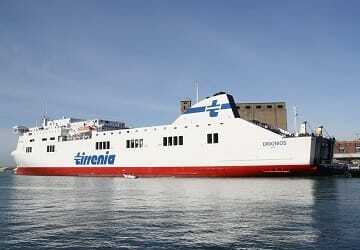 "Tirana ferry from Sicily to Sardinia"
Ferry very comfortable with very good embarkation and disembarkation. "Not taken on the boat, on the contrary." Well organised. In Palermo, we had to search for the ticket office because we were dropped off in the port by a taxi, and not at the ticket office. Accommodation outside cabin was OK. Initially, it was unclear on board that the key must be collected at the reception desks. The staff kindly showed us the way. recently made the overnight crossing in a four berth cabin. Room clean and tidy, bar and restaurant more than adequate for the journey. Probably the worst part as a foot passenger was waiting in a cold gusty wind until just before we were allowed to board about 30 minutes before departure.